This fully-furnished first floor condominium opens out to the expansive green lawn overlooking the ocean- no steps and no stairs. The living room, dining room, kitchen and family room all offer ocean views. 1100 sq ft of interior plus an additional 158 sq ft of covered lanais for a total 1258 sq ft. of living area. Enjoy dining on the covered lanai off the living room or enjoy reading and relaxing on the second lanai off the family room. The entire condominium was re-tiled with marble floors that gleam. The kitchen and bathrooms are updated with high quality materials. The kitchen appliances are new or like new. Enjoy two bedrooms each with their own bath. The master bath has a large walk-in shower and the second bedroom has a full bath. This condo has not been used for vacation rental. 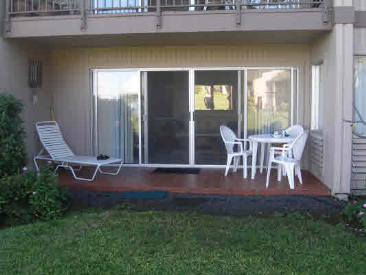 Fully furnished and ready for you to move in or start to vacation rent.